#TagTeamTop5 Reveal is coming…February 4th! BIG NEWS to announce from the Indy Power Rankings. 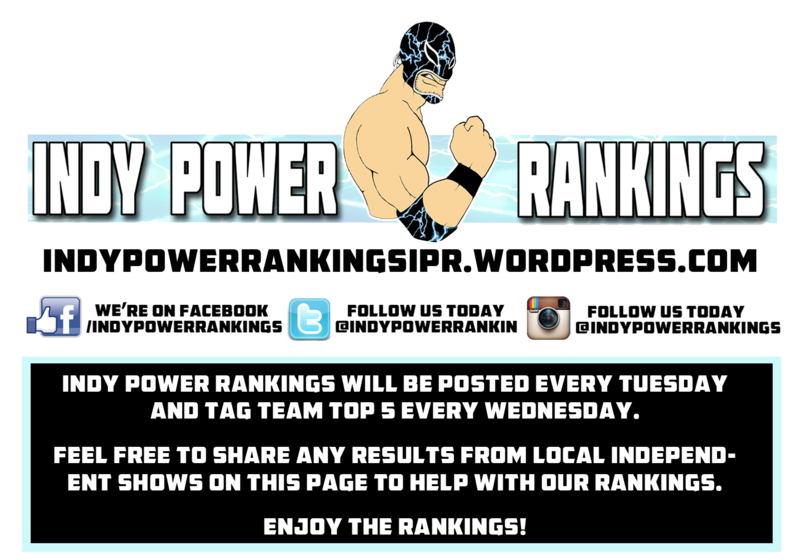 Since January of 2014 the crew has been voting on the Tag Team Top 5, but up until now, there was no official “Reveal” like there was for the Indy Power Rankings (Tuesdays at 3 PM EST on Filling the Void Radio Network on Blog Talk Radio). 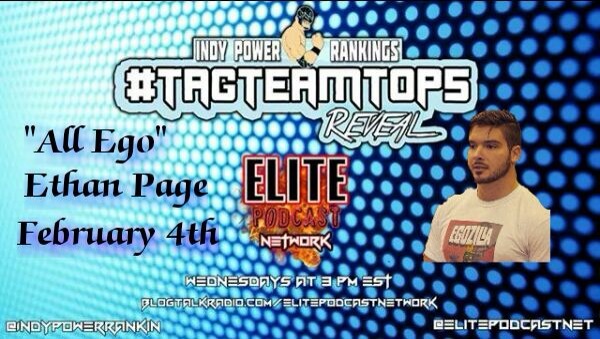 NOW that all changes as on February 4th, 2015 at 3 PM EST on Elite Podcast Network (the same carrier who brings you the Indy Power Rankings Live on Tuesday nights)!!! That being said, we didn’t waste any time whatsoever as “All Ego” Ethan Page will be our first guest on February 4th! If you don’t know Ethan Page, you’re really missing a star in the making on the indies. In addition to being ranked over the last couple of weeks in the Indy Power Rankings, he has been tearing it up in AIW, AAW, Alpha-One Wrestling, and has made a few appearances in ROH where he’s looking to become a full-time member of the roster. 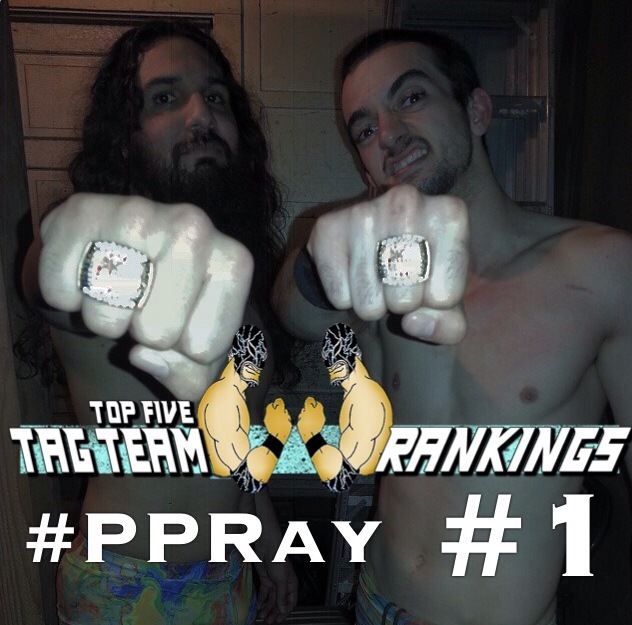 We’ll discuss all those things and so much more after we release next week’s Tag Team Top 5! Don’t miss it! 1. PPRay (Ray Rosas & Peter Avalon)-This wasn’t even close. This slimy West Coast tag team came into the AWS Race for the Ring Tournament with a solid shot of winning the whole thing and they did just that. The AWS Tag Team Champions defeated Los Luchas on 1/23 to retain the titles, then beat Los Bandidos in Round 2, and then defeated Forever Hooligans in the Finals to win the AWS Wrestling Care Race for the Ring Tournament on 1/24. Despite having a great 2014, this is their first #1 ranking in the Tag Team Top 5 and honestly, we expect them to do it again before 2015 is up. 2. Dia.Hearts (BxB Hulk & Kzy)-This faction has been absolutely amazing in 2015. 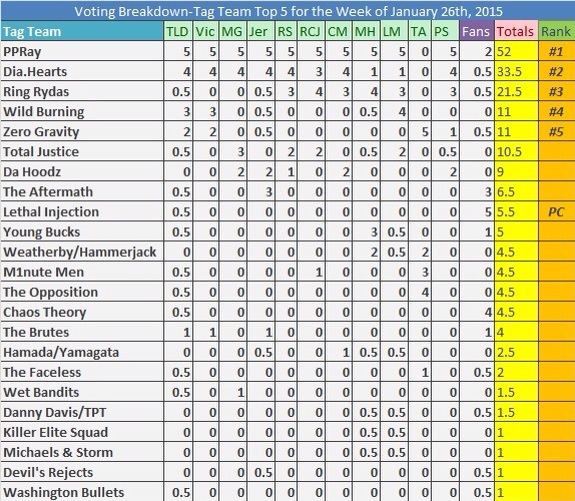 After a different pairing (Dragon Kid & BxB Hulk) were #2 last week, a different pairing grabs the #2 spot this week. This team defeated Millenials (T-Hawk & U-T) at Dragon Gate on 1/20 and then defeated Jimmyz (Jimmy Susumu & Mr. Kyu Kyu Naoki Tanizaki Toyonaka Dolphin) on 1/24 to go 2-0 for the week. This team has won their last 3 matches as a team. If a few of these teams within the stable can really team consistently it’s entirely possible that they’ll be taking a significant spot in the 2015 Tag Team Top 50 at the end of the year. 3. The Ring Rydas/OI4K (Ring Ryda Blue & Ring Ryda Red)-“A rose by any other name…” is just as good when it comes to this tag team. They absolutely own the Midwest indies (and elsewhere) when it comes to tag team wrestling. This brother tandem shot all the way up in the 2014 Tag Team Top 50 and they’re already making waves together in 2015. Call them OI4K or you can call them The Ring Rydas in JCW…but at the end of the day, you better call them successful. They are winners and let’s face it, that’s exactly what the Indy Power Rankings and the Tag Team Top 5 is all about. 4. Wild Burning/Burning Wild (Jun Akiyama & Takao Omori)-The former #1’s and AJPW Tag Team Champions teamed once again last week as they defeated Akebono & Masanobo Fuchi on 1/24 in a non-title match. They have won 6 of their last 7 matches and they continue to prove that they are one of the most dominant tag teams in Japan as they rack up win after win in 2015. With #1 ranking already in the bank this year, it will be interesting to see what else they can do as the year rolls along. Once again, their ranking helps prove that international talent is really kind of the new flavor of 2015 for the Indy Power Rankings and Tag Team Top 5. 5. Zero Gravity (Brett Gakiya & CJ Esparza)-It took an entire year, but this amazing Midwest tag team FINALLY gets into the Tag Team Top 5 after defeating The Hooligans in a Double Dog Collar and Chain Match at AAW on 1/23. With wins in 7 of their last 9 matches, this undersized tag team has been tearing it up recently without getting enough respect from the voters. In 2015 they have already beaten last year’s #1 (The Hooligans) in the Tag Team Top 50 as well as last year’s #4 (Team IOU). Amazing start to the year for a team who is likely going to start getting more recognition in 2015. 1. People’s Champ. 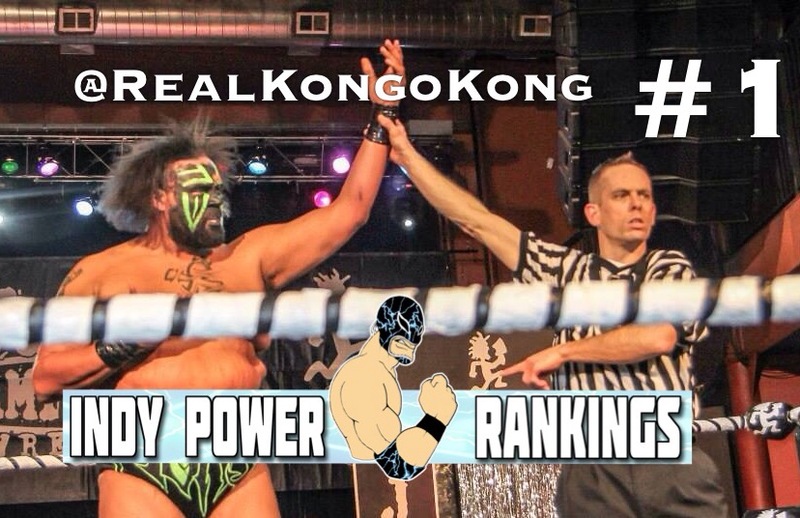 Kongo Kong (@RealKongoKong)-The dominant monsta had just one number one ranking in 2014, but managed to climb all the way up to #3 in the IPR 100. He’s already starting off this year in similar fashion, but he’s doing it sooner than he did last year. 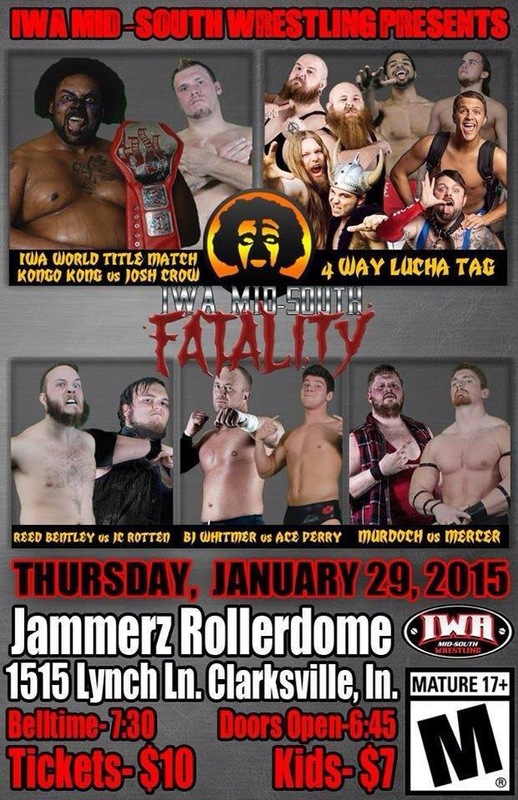 The IWA Mid-South Champion defeated Mark Vandy at BCW in Canada on 1/20, then beat Jimmy Jacobs on 1/23 at JCW, then won a Gauntlet (his 2nd in 2 weeks) vs. Reinmetal, Cory Lyon, & CJ Anderson on 1/24, and then finished the week off, defeating Brian Defiance the same night. A 4-0 record for the week (or 6-0 if you prefer) made him almost a complete lock for #1 this week. Very few have been dominant over the last year than Kong, but he’s a special kind of monsta. Also, to add to his vast list of accomplishments, he is the People’s Champ this week, becoming just the second person to win both the singles online voting competition AND the official vote. It was almost a complete sweep for this unstoppable savage. 3. Minoru Suzuki-Unlike Dragon Kid, Suzuki picked up a singles victory in the “Land of the Rising Sun” on 1/25 when he defeated Jado. He also picked up various tag team victories to go 5-0 for the week at Pro Wrestling NOAH, proving once again that the international (and specifically Japanese) influence on the Indy Power Rankings continues to grow. Not only did he go 5-0 last week, he has won 10 straight matches. Impressive stuff and if he can continue this success, there’s no doubt that you’ll be seeing his name pop up time and time again throughout 2015. 4. 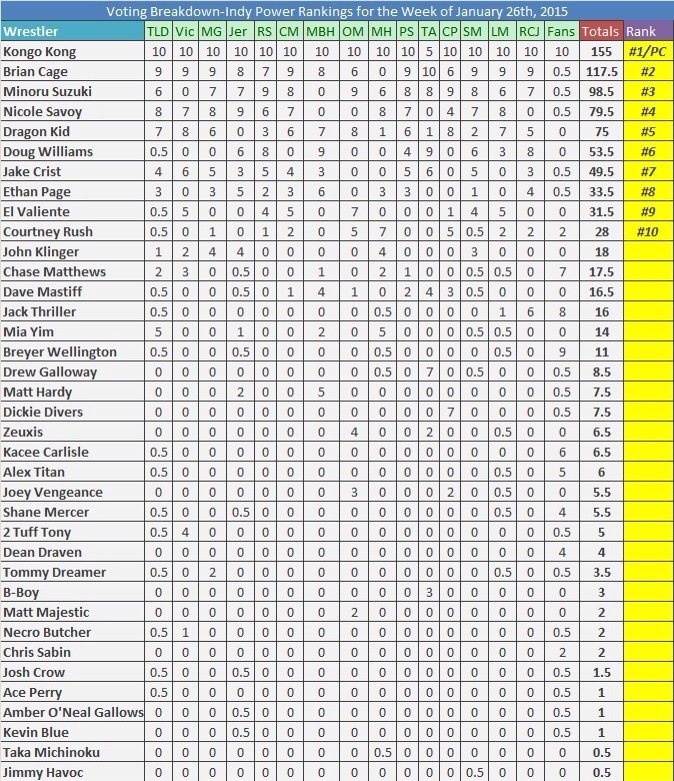 Nicole Savoy (@NikiMSavo)-The winner of the AWS Race for the Ring 2 becomes the highest ranked female so far in 2015. On 1/23 she defeated Taeler Hendrix and then moved on to defeat Kahmora in Round 2 on 1/24, and then defeated Hania the Huntress and Marriah Moreno on 1/24 in the Finals. Impressive weekend for Savoy who has never even garnered a mention in the Top 10 in the past. That being said, it proves that one big tournament win can shoot you right up the rankings and Savoy was the beneficiary of that victory. Now with most of 2015 still in front of her, time will tell if she can build on this ranking with further visits to the Top 10. 5. Dragon Kid-One of the best junior heavyweights in Japan hops into the Top 10 this week after going 4-0 on the week (and 3-0 last week) for a grand total of 7 wins and 0 losses over the last 2 weeks. Amazing run of victories for the Dragon Gate star, but what he’s truly missing that is keeping him out of the #1 spot are some signature singles victories. Most (if not all) of his recent victories have been in various tag team matches. Granted, the likes of Uhaa Nation and Ricochet lived rather heartily off of those types of wins, but Dragon Kid will need to rattle off a win or two in singles to build on this solid ranking in the future. 6. Doug Williams (@DougWilliamsUK)-Another appearance for one of the best in the UK as the 4FW Heavyweight Champion teamed with Andy Wild on 1/23 at PCW to beat CJ Banks & Kid Fite, and then defeated Koji Kanemoto on 1/24 to retain the title. With 5 straight wins and 11 wins out of his last 12 matches, Williams is off to a hot start in 2015. Though he may not be in the international spotlight in TNA and/or ROH anymore, he’s still tearing it up in the UK, picking up wins and titles wherever he goes. 7. Jake Crist-The Rockstar Pro Champion (and multi-promotional tag team champion) had another good week as he teamed with Chris Hall at Rockstar Pro on 1/22 to defeat JTD Inc. and then teamed with Dave Crist at JCW on 1/23 to defeat Super Tiger & Spider Monkey to go 2-0 for the week. He is now 4-0 on the week and continues to prove that consistency is one of the many keys to being ranked. He is sitting pretty at the current #1 spot in the 2015 IPR 100, but he’ll need to pick up wins to retain that spot throughout the year with the likes of Sugar Dunkerton, Kongo Kong, and Ace Perry hot on his heels. 8. Ethan Page (@OfficialEgo)-“All Ego” makes another appearance in the Top 10 this week after defeating DJ Z (Zema Ion) at AAW on 1/23. This can’t miss star has won 5 straight matches after losing in the 2nd round of the PGP Ryan Buckley Memorial Tournament. While he’s no stranger to the Top 10, he’s still continuing his push to make his way into the IPR 100 this year after just missing out last year. He is truly one of Canada’s finest and we fully expect him to find a solid ranking at the end of the year. 9. El Valiente-It’s a first time appearance for this Mexican sensation as he teamed with La Máscara, Brazo de Plata at CMLL on 1/20 to beat Kraneo, Rey Bucanero and Damián el Terrible, then beat Kamaitachi on 1/23, and then teamed with Atlantis and Stuka Jr to beat Felino, El Mephisto and Arkángel de la Muerte by DQ on 1/24 to go 3-0 for the week. With him winning 7 of his last 8 matches, his first appearance in the Top 10 is a well-deserved one. We shall see if he can continue to be the Lucha standout this year. 10. Courtney Rush (@WinnipeggerRush)-She is the NEW PWA Canada Elite Women’s Champion after beating KC Spinelli for the title on 1/24. If that wasn’t enough, she followed up on that victory by defending and retaining the title vs. Jody D Milo on 1/24 to go 2-0 for the week. She has won at least 4 straight matches, making her the second female in the Top 10 this week. Good week for the ladies, but we expect to see even more diversity among the female gender as the year moves on. #9 in the online poll. 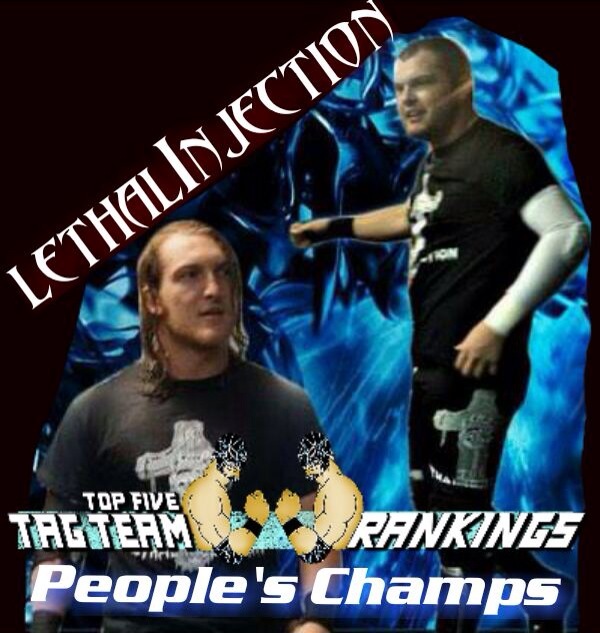 Who should be #1 in the Tag Team Top 5 for the week of 1/26/15? Next week’s Top 10 will be revealed on “The Indy Power Rankings Reveal” on Tuesday, January 27th at 3 PM EST as it will be yet another Hype Central Edition of the show! Be the first to know who got ranked, who got snubbed, and who is #1 this week! 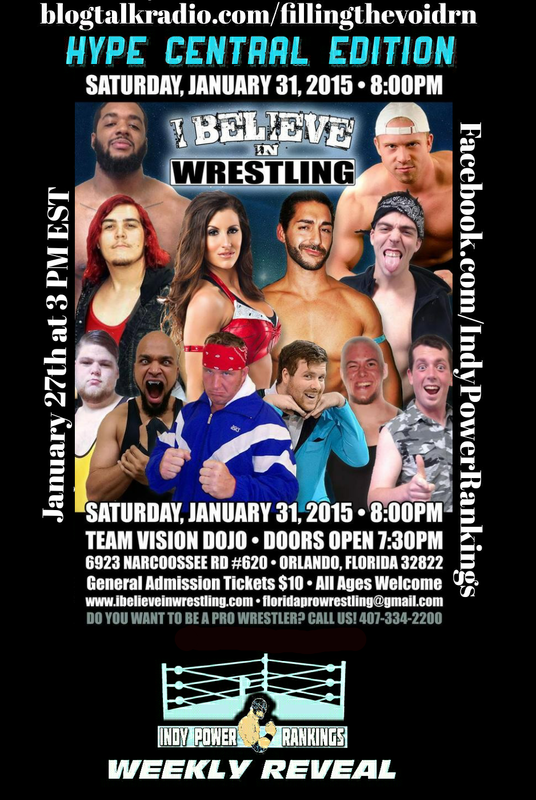 After we reveal the Top 10, we’ll talk to about I Believe in Wrestling’s next STACKED show on January 31st! Tune in!!! 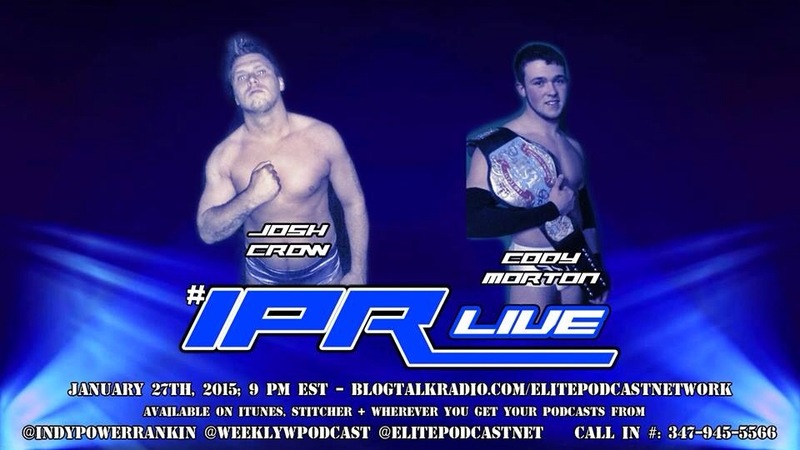 Also, don’t miss IPR Live with Cody Morton & Josh Crow at 9 PM EST on 1/27! Sonjay Dutt def. Caprice Coleman. Matt Hardy def. Zane Dawson and X-Pac to retain he Wrestlecade Championship.